If you’re a homeowner, then you’re probably aware of the amount of maintenance that furniture and decorations can require. This can be enough of a pain when you’re dealing with your indoor rooms; the list of chores can be endless! Sweeping, mopping, scrubbing, dusting, laundry, vacuuming, and polishing everything in your home is a time consuming task. This workload adds up and can make countless hours of your free time vanish. Who wants to add a new dimension to cleaning and maintaining their furniture? 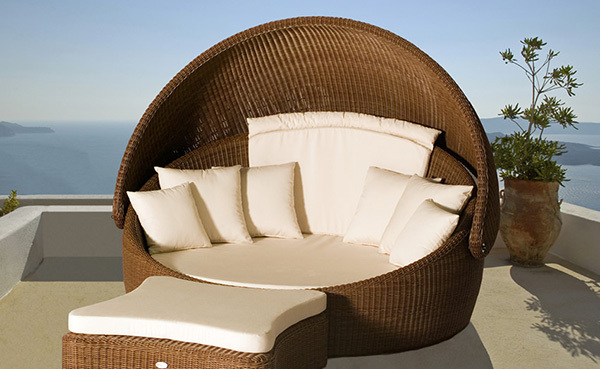 Many types of outdoor furniture require careful upkeep and a constant eye on their status. Why is this furniture so needy? Being outside exposes this furniture to the fury of the elements. Mother Nature is a cruel force, and wind and water can destroy the frames of your furniture. When this damage is already done, it can’t be reversed, and you can end up with worn down, visually unappealing furniture. Replacing a patio set every time this happens is an unsustainable practice. Despite these dangers, purchasing and applying expensive sprays and carefully washing and protecting the frames of the furniture take the fun out of a summer set. There’s another option that allows you to enjoy the luxury of a summer patio set without having to break your back and drain your free time protecting it from wind and rain.Modern patio furniture is equipped to handle the risks that summer weather brings, while also being comfortable and stylish. It can be hard to tell the difference between furniture that will resist damage and furniture that will be ruined at a glance. This guide will outline the dangers of wind and water and explain why modern outdoor furniture can resist them. When you’re standing on your patio on a lovely summer day, it’s hard to see the surrounding world as dangerous. However, the weather can be volatile, with sudden changes. One day, there can be a beautiful blue sky without a cloud in sight; the next, pouring rain and rumbling thunder. If you don’t see the natural elements as a danger to your outside furniture, then consider rock formations that have been smoothed away by erosion. If mountains can fall, then so can your patio furniture. Here’s a rundown on exactly why these two forces must be taken into account when picking modern patio furniture. The Trojan Horse is a tale of a clever case of subterfuge carried out by the Greek army. The Greeks had been sieging a wall for 10 years, and finally they decided to take another approach. They constructed a huge wooden horse and hid their most elite troops inside, then left it behind as they pretended to give up in defeat. The Trojans brought the horse inside their walls, and the soldiers crept out, slew the guards, and opened the gate. Moisture takes the same nefarious tactic when it assaults your outdoor furniture. Rain and water in the air makes its way into small cracks, imperfections, and holes in the frame of the furniture. There it lies in wait, slowly corroding away at the integrity of the frame. If the temperature drops, this water freezes, expands, and causes even more damage. So why can modern patio furniture ignore the risk of rain and humidity? Their frames are made out of resilient materials like resin wicker or certain kinds of wood. These types of frames don’t allow water to worm its way inside the frame to cause trouble. Moisture isn’t a surprise hazard to many homeowners, but some people don’t realize what a problem wind can be. The issue isn’t with a light breeze, but instead a gusting gale. Wind can damage furniture by knocking it about, or in extreme cases, sweep it far off the patio. Modern patio furniture is designed with this problem in mind, and can take far more of a beating than older sets. With extreme weather becoming more and more common each year, you’ll want to be prepared. What is the Difference Between Modern Patio Furniture and the Alternatives? ‘Modern’ is a prefix that lacks meaning to some people. What is ‘modern’ in the context of outdoor furniture? What does it mean? The answer is that these kind of patio sets were constructed from the ground up with modern needs in mind. Even classic elements can be appropriated with modern twists that make them safer and easier. Instead of picking out the first glass set that wins your heart but risks breakage, you can look at tempered glass that has passed quality control standards. Synthetic wood-effect finish takes the randomness out of natural grown trees while giving you the same look and feel. Additionally, extreme weather has become more common in recent years. Modern furniture takes these problems into account, thus reducing the risk that you’ll have to shell out for a replacement patio set. If you’re looking for modern patio furniture, one of the biggest signs you should look for is the material of construction. Teak wood, resin wicker, rattan furniture, and steel are all popular and affordable materials used in modern furniture. All of these materials are durable, stylish, and most importantly resistant to wind and water, making them an excellent choice for adorning your back yard. The elements can be unforgiving on outdoor furniture. However, that doesn’t mean that the solution is to spend valuable time and money helping protect and shield your patio set from the elements. There’s a way to enjoy the luxury and relaxation of your backyard without constantly applying expensive sprays and other protection. Modern patio furniture offers homeowners a great solution. Enjoy the summer without worrying about moisture or wind and the upkeep of your furniture. Prepare your patio for summer hosting with a set of modern outdoor furniture from Beliani that fits your personality and your life!